This picture is odd in more ways than one. This is another one of my patented hit-and-runs, obtained during my Big Bear Lake road trip. I had seen pictures on Google Earth of this sign and was quite looking forward to it. So there I was, on I-90 going east out of Sioux Falls, South Dakota, and I see the sign. There's a rest area there as well. "Great," I figure. "I won't have to stop on the side of a busy interstate where I might present a hazard to my fellow motorists." 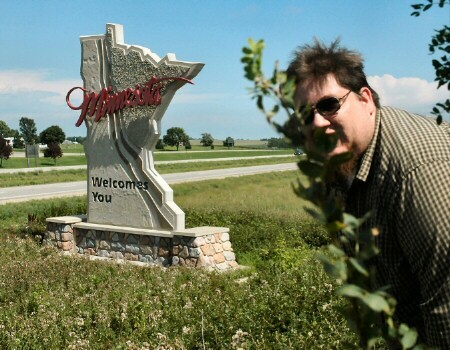 As I pull into the rest area, I see the large Minnesota sculpture gradually disappear behind a berm. "Uh oh," I thought. I had already driven about 15 miles out of the way, not including the return trip to get back to I-29 in order to photograph this sign, so I'm not going to double-back in the middle of an existing double-back. It's also too far to walk back down the ramp and around the berm to the sign. 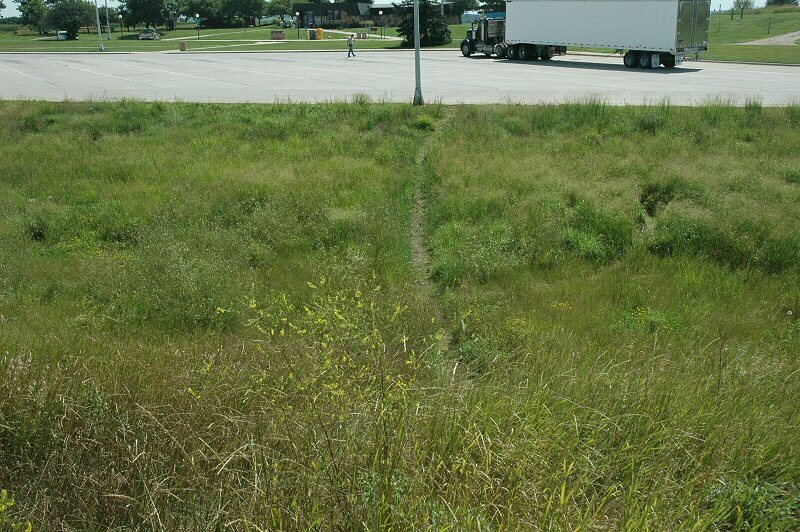 As I cross from the car to the truck parking lot, I see the berm in all its overgrown glory. As I approach it, I see among the two-foot-tall grass amid the din of summertime insects a rather well-worn path down into a small depression and then up over the berm. Once up there, the path goes to the left around a small tree, and then disappears. There seems to be no path going down the other side. So cursing silently to myself, I set up the tripod and try to take a picture. This is one that I will revisit someday. 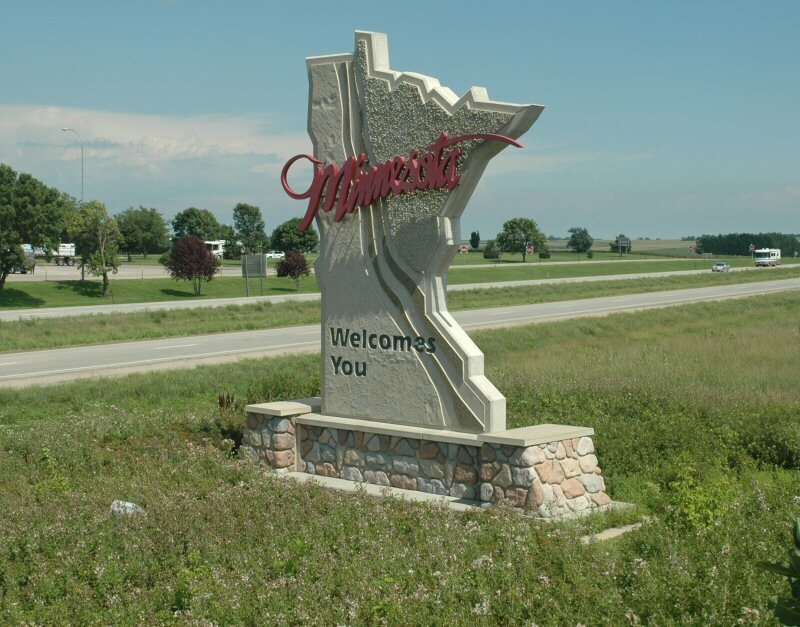 So my advice to you, if you are contemplating photographing this sign while driving on I-90 from South Dakota into Minnesota, is to stay on I-90 and not to get off at the rest area. But if I did write, I wouldn't expect a favorable response from MinnDOT. After all, this Minnesota sign actually stands several hundred yards from the border, well inside the state of South Dakota. The South Dakota sign on the other side of I-90 is closer to Minnesota than the Minnesota sign is. I was returning from Winnipeg, Manitoba, Canada, on business. I requested that my stopover between Winnipeg and Newark, New Jersey, be in Minneapolis. I did this 1) so that I could see my old college roommate who lives in Rochester, Minnesota, and 2) so that I could add Minnesota to my list of visited states. I had an added stroke of good luck in that my connecting flight out of Minneapolis would be delayed by some two hours. 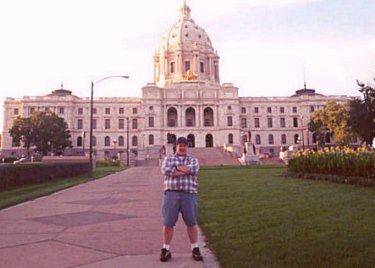 This gave me the opportunity to go out to dinner with Mark and, yes, to say, "Hey Mark, could we drive to St. Paul so I could get a picture of me in front of the state capitol?" That's right. St. Paul is the capital of Minnesota, not Minneapolis. Just like Sydney is not the capital of Australia (it's Canberra). This is the basis for the trivia question, "Which two state capitals end in '-polis'?" Answer is at the end of the page. After a little creative navigation we made it to the Capitol grounds. I kissed the ground signifying my first visit to Minnesota (ok, I connected through Minneapolis on the way up to Winnipeg, but I did not venture out of the terminal) just a few steps from where I am in this photo. Though it never happened, it was awesome to stare at the Minnesota Statehouse and just imagine Governor Jesse Ventura rappelling down from a helicopter to take the Oath of Office as he wanted to do. As for the building itself, of the twelve state capitols I have thus far visited in conjunction with this project, Minnesota's is far and away the most impressive I have seen (Pennsylvania is a close second). This capitol projects a sense of power and authority, as well as stateliness and elegance. As I was with some people I didn't have a chance to spend much time here (not to mention I had a plane to catch). It's a little hard to see, but the rotunda has gilded accents all around. While the rotunda itself doesn't have all the columns that the U.S. Capitol may have, so far Minnesota most closely resembles St. Peter's. So after a few minutes it was back to the airport for me. After bidding Mark adieu, and with "Jesse: Mess With Me, Mess With My Governor" coffee mug in hand, I was on my way back home. The answers: The first is easy: Indianapolis, Indiana. The second is the one that everyone forgets: Annapolis, Maryland. This page loaded in 2.671 milliseconds.